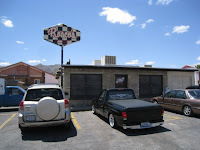 Rosco's Burger Inn in El Paso, Texas is a delightful and friendly throwback of a place. I travelled here after a couple of days of work in Juarez. Rosco's has a great location on a Y of a street. The checkerboard sign beckons to burger lovers. I parked my puny borrowed Tahoe among the really big SUVs in the lot. Stepping inside, I felt instantly welcome and took a seat at one of the faux-wood laminate tables. The place probably hasn't changed much since it was founded in 1955. It shouldn't. There are 8 tables and a counter in the front room. The cooks toil behind the counter. There is an extra room on the side with another 6 or so tables. I went to the side room to find the bathroom, but saw two doors marked "Not A Bathroom". I was directed outside, as it should be, to a sparkling clean room smelling of chlorine. I ordered a double-cheeseburger with everything, fries and onion rings. The double paddy mess was great. 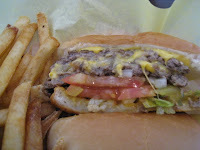 Thin hot patties were stacked high with onion, pickle, tomato, mustard and American cheese on a nicely toasted bun. This is your classic burger joint burger that only works when all the ingredients play together. And they play well at Rosco's. The medium cut fries were, hot salty and tasty. Onion rings were the best of everything crispy, large and breaded crunchy. I didn't get prices since I wasn't given a menu and I ordered from the waitress' recommendation. I think it all came to about $13 with a drink. I guess I will have to return to complete my review. Not a problem. I can't wait. My wife Pat found this blog on yelp. Some favorites, but some new ones to try. So many burgers, so little time. Michael Bauer, the food critic for the San Francisco Chronicle, talks about some of the more expensive hamburgers in the Bay Area. he also ruminates on how much a burger should cost. He points out a few spots to get a good, if somewhat expensive burger in the Bay Area.